Every cloud has a silver lining! We have found a superb digger owner & driver, Chris Groom, who owns 3 diggers. He is also a monumental stonemason and worked on the renovation of the 200 year old remote downland monument, “Harvey’s Cross”. He has passed on my contact details to media cameraman David Barrie who is interested in filming our dig. Unfortunately the digger trailer needs work on its brakes, which has delayed backfilling till next week. This led to our dig volunteers encouraging me to use this delay to do some final digging. 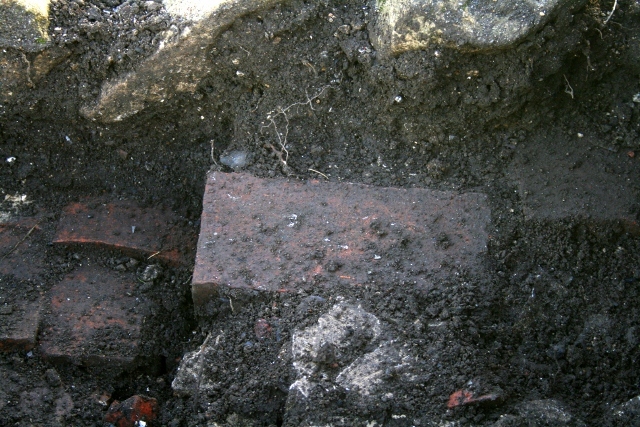 Fortunately I succumbed to their gentle pressure, for we found two new features below the 1940’s ground surface! These were found following a thorough sweep of a metal detector across the site, in case we had missed anything in our search for a well or water-tank. 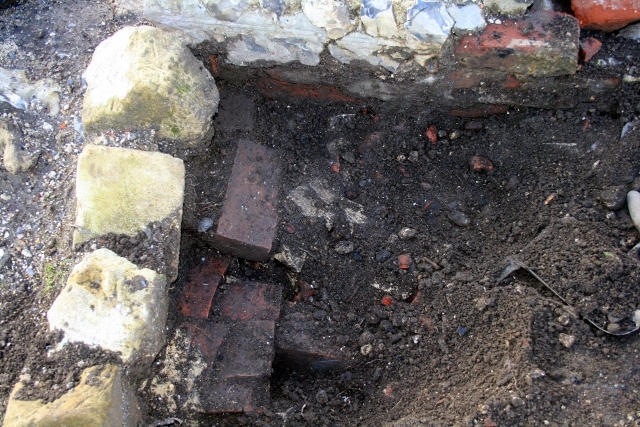 Whilst there is still no evidence for such a structure in front of the cottage, we did find some nicely laid large flint slabs, 5-10cm under the front yard surface, in a straight line diagonally between the front door and the front garden gate. They sat on clean sub-soil, and passed under the edging stones of the last phase of the cottage’s path (which was probably contemporary with the early 1930’s rebuilding of the outside toilet), and they may date back to the original construction of the cottage. 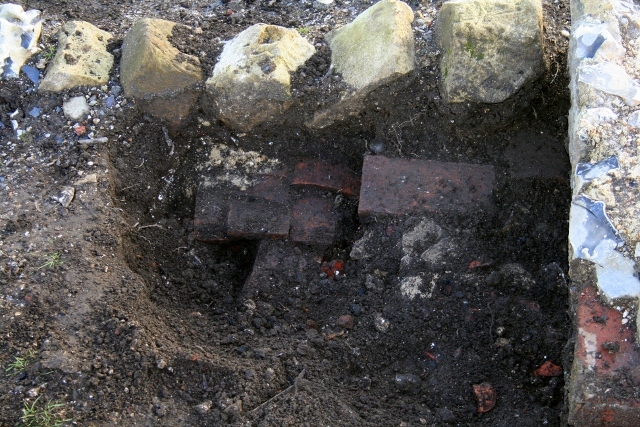 The other feature was a ‘rain water soak-away’ which extended about 40 cm east from under the foundations of the outside toilet. It was not fully excavated. 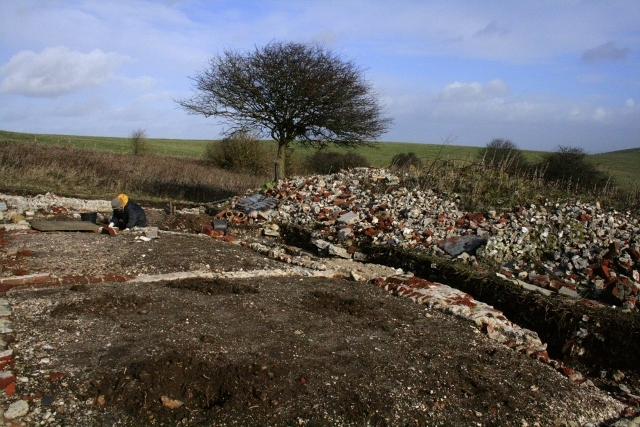 The metal detector proved that the areas assumed to be free of archaeology were clean of at least metallic objects. Elsewhere it mostly detected the inevitable rusty nails, as well as a variety of larger miscellaneous iron objects, including a small rusty padlock in the floor of the indoor ‘coal cupboard’. Also found, in front of the cottage, was the oldest coin of the dig – an 1881 farthing. Our ceramic finds, from this latter area, were very nice indeed and included most of a small ceramic frog, as well as another fragment of the hatching chick egg cup. More worrying/exciting was that one of the metal detector targets inside the cottage has now been confirmed by EOD (bomb disposal) as the lower part, with fins, of a previously fired 3″ mortar. It was removed by them for safe disposal, since explosive material can sometimes find its way into the rear section.